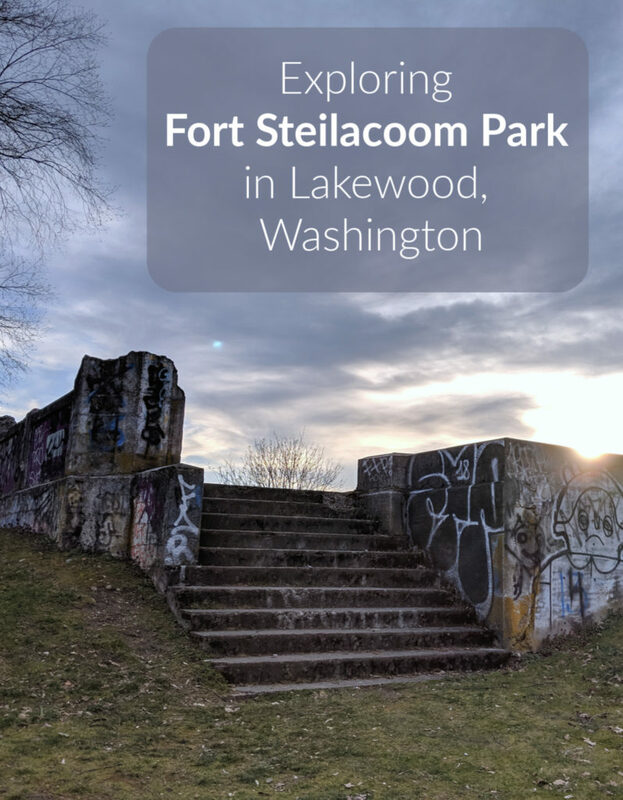 The first time I heard of Fort Steilacoom Park, it was from a coworker years and years ago. 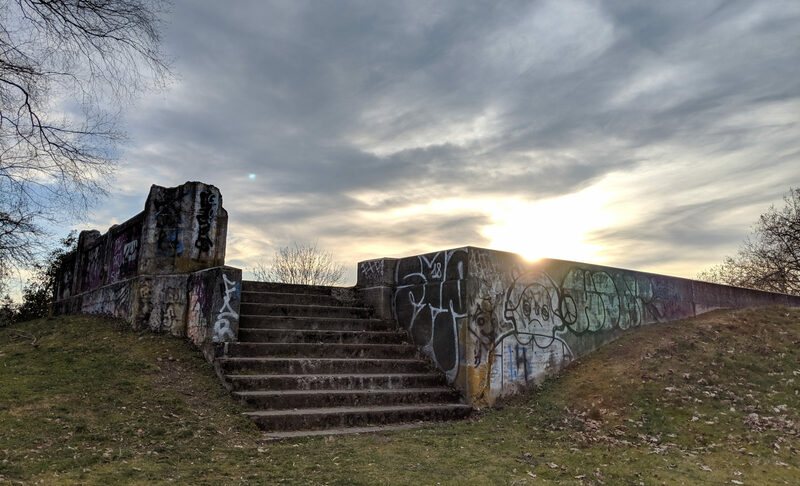 My coworker and her boyfriend went out to the park just before dark and explored a former insane asylum, hoping to find ghosts or at least hear an inexplicable rattle or two. I was intrigued. It’s not everyday you come across a park that has a past as the grounds for a former insane asylum. Since then, I’ve been out to Fort Steilacoom Park a few times and it’s one of my favorite spots in Pierce County. It’s a spot that travelers to the area deserve to know about as it’s not on the way to anything major, and yet if you yearn to appreciate the unique and vaguely creepy, all while your kids play on a fun playground and run through tons of wide-open fields, then this is the place for you. 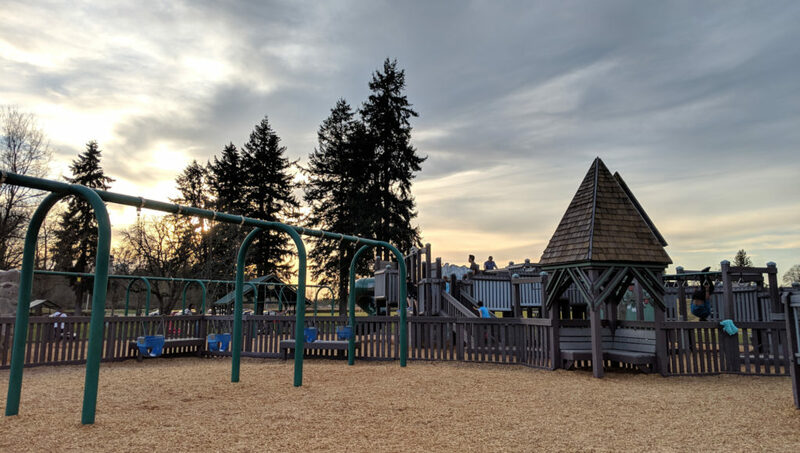 Fort Steilacoom Park is located at 8714 87th Avenue SW, Lakewood, WA 98498. The playground offers lots of places to climb, swing, and explore. 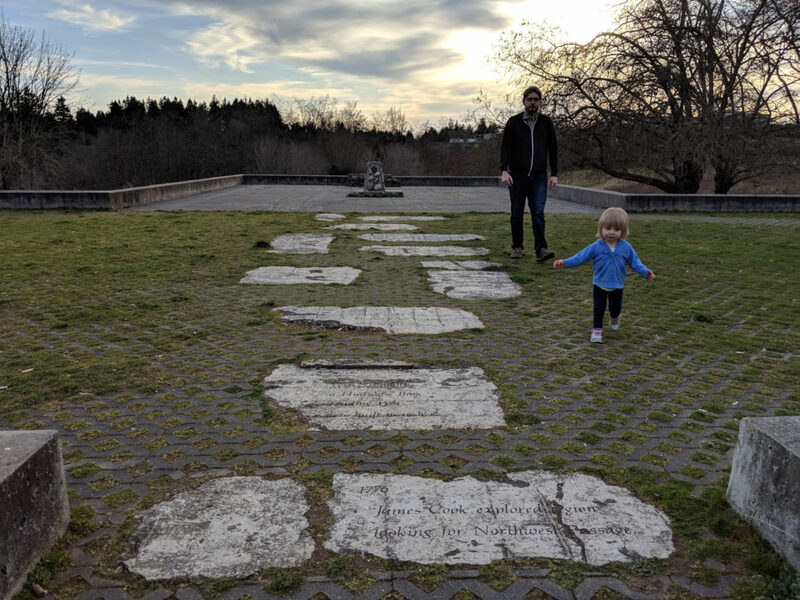 On the surface, Fort Steilacoom Park is a serene and fun place to take the kids. As you drive in, you’ll see fields aplenty and the playground. You’d never know the history of the park unless someone told you or unless you go a bit deeper. The playground is pretty sweet and looks similar to the old wooden playgrounds of the ’80s. The instant nostalgia is just a bonus perk of this place. The playground has a “Tot Lot” area where smaller children can climb, jump, and swing, as well as a larger area for kids of all ages to climb higher, jump higher, and swing higher than they can in the tot area. While I’ve never seen this playground on lists of best places to take toddlers, my toddler loves it. Like, she fights me when we have to leave. Rather than the usual metal or plastic playground equipment, this playground has a lot of wooden steps and feels kind of like a fort. My toddler loves steps. Loves. Them. However, take heed, the playground isn’t huge and older kids might not be as impressed as my little monster. Beyond the playground, you’ll find a whole lot of open spaces at this park so bring along a ball or Frisbee or outdoor game of your choice. There is also a soccer field, baseball diamond, picnic areas, a dog park, an area where you can fly your drones or RC planes, and lots of trails. 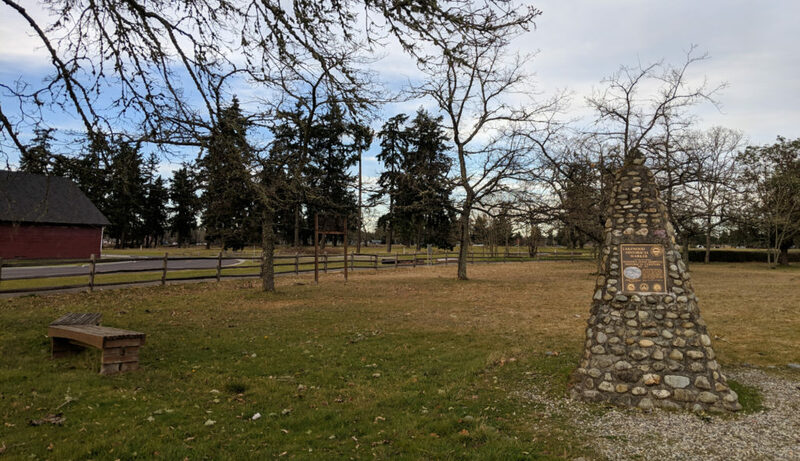 While this park doesn’t have the rugged appeal of my favorite Pierce County Park – Point Defiance – it does have plenty of trails both out in the open and in wooded areas. A walk around serene Waughop Lake at the back of the park is always enjoyable. On walks along any of the pathways, keep an eye out for plaques about the park’s history. Sure, you can walk right past them too, but reading is good for you. The cemetery is near the farm and might look like just another field, but look closer and there are more than 3,000 headstones here. If you visit Fort Steilacoom Park, you will notice the old barns without fail. They’re out in the open and impossible to miss. The barns are from the park’s long history as a farm that started as early as 1844, but the farm is mostly tied to the fact that from 1871 until 1965, this park was the location of the Insane Asylum of Washington, now known as Western State, and now located across Steilacoom Boulevard from the park. The residents of the asylum worked on the farm as part of their occupational therapy, doing everything from working the fields and orchards, to raising livestock, to canning. Beyond providing therapy for the patients, the farm provided food for the hospital patients and staff. But while the barns are plainly obvious, less obvious features include a cemetery and a dormitory. Even though the cemetery is right out in plain sight, you might just walk by it as headstones are flat against the ground. But 3,218 hospital residents, staff, and volunteers are buried at this cemetery! The top of the dormitory ruins offers a view of the lake as well as these stones that tell the history of the grounds. The dormitory is tougher to find, but is worth it. To get there, locate Waughop Lake and take the trails just north of it. You’ll find yourself next to a hill where the trails to get on top of the hill are narrow and you may or may not have to dodge a blackberry vine or two. But scramble up the hill (which is easier without a toddler than with one) and you’ll find yourself in a clearing with an impressive set of ruins right in front of you. This is the former Hill Ward – a dormitory for male patients at the asylum that once stood three stories tall. Today, only the foundation and some exterior stairs and walls remain. My toddler was thrilled to see there were stairs. Hill Ward was built in 1932 and closed in 1965. From there, the building was partially demolished and used as a search and rescue training ground until about 1999. For many years after that, Hill Ward remained in disarray and inspired haunted tales in the area – visitors hearing rattles and voices within, visitors sneaking through the fences after dark. After all, the insane asylum has a complicated past during a time when mental health treatment was not without controversy and allegations of abuse. However, in the mid-2000s, the ruins were tidied up. The building was completely demolished and turned into a memorial, but the memorial traces the original footprint of the building and the stairs, some exterior areas, and patient pathways leading to the building are all original. There are some pieces of the original structure left around the footprint as well. Graffiti artists have had their way with the structure, but it almost feels like it fits (although, I have to admit, I found it sad that someone spray painted all over plaques explaining the history of the place). Stand still long enough and you can imagine the patients in that very same space. It’s especially effective at sunset or just as the park is getting ready to close. 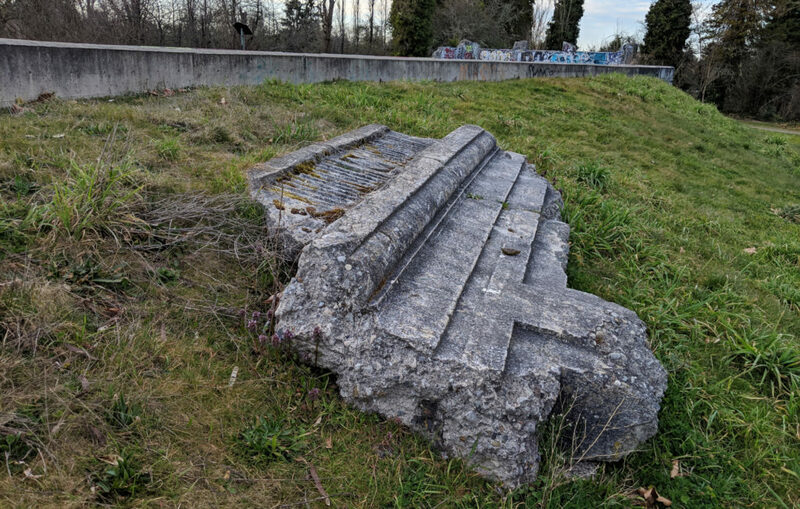 Fort Steilacoom Park is historical, it’s fun for kids, it’s a place that might make you reflective and curious to dig more into the history here, and it’s just the right amount of creepy. Spend your time playing or walking around the lake, or dig into the local history.